Mega Sale! Save 29% on the Cavalier Pets, Extra Large Dog Bowl Mat for Cats and Dogs, Silicone Non-Slip Absorbent Waterproof Dog Food Mat, Water Resistant and Easy to Clean, Unique Paw Design, 36 by 24 Inch, Beige by Cavalier Pets at People For Pets. MPN: 43238-56102. Hurry! Limited time offer. Offer valid only while supplies last. CAVALIER PETS Tired of constantly cleaning up cat litter tracks around the house? Tired of water and food bowls spilling on your beautiful floors? Tired of constantly cleaning up cat litter tracks around the house? Tired of water and food bowls spilling on your beautiful floors? Tired of flimsy, small mats that don't get the job done? Well, Cavalier Pets introduces to you our Extra Large Jumbo sized Cat Litter Mat with Scatter Control Technology. The perfect mat that catches and traps litter, protects floors from water, drool, dirt, food particles and bacteria. It is 100% waterproof making it super easy to clean, and can be used in a variety of different ways because of its elegant design and sleek look. This uniquely designed pet mat has a woven, multi-layer surface that will trap almost all litter, dirt and water that comes in contact with its surface. Made of high quality, durable silicone and PVC materials, this Eco-Friendly mat is BPA Free ensuring safety for both your cat or dog. 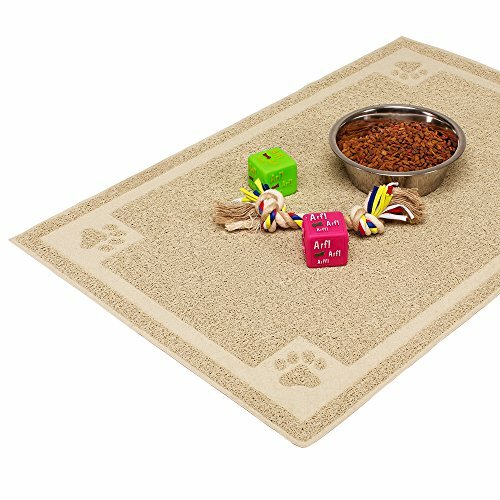 This pet feeding mat is 36 by 24 inches occupying plenty of flooring space for added protection and cleanliness. The perfect size for large litter boxes, pet feeders, and feeding bowls. It has a non-skid and non-slip backing that will ensure your mat remains in one place. Once you're ready to clean your mat, simply vacuum, shake off, or rinse and/or hose down. So, if you're looking for a high quality mat that will last and get the job done, you have certainly come to the right place. Spoil the Kings and Queens of your life and grab your mat today by clicking on ADD TO CART. We offer a ZERO HASSLE, 100% CUSTOMER SATISFACTION GUARANTEE. LARGE JUMBO SIZE - A generous 36 by 24 inch surface makes this mat large enough for litter boxes, elevated feeding stations, and feeding bowls with plenty of room to spare. SUPER EASY TO CLEAN - Why make life difficult with a mat that can't be cleaned thoroughly and easily? Our mat is super easy to vacuum or shake off. Not only that, because it is 100% waterproof, you can simply hose down or rinse off with water and soap. AMAZING SCATTER CONTROL - Tired of cleaning up cat litter tracks around the house? This litter mat is designed to catch and trap almost all litter leaving the littler box or the paws of your furry friend. The woven design gives multi-levels of added litter control, causing less mess and more protection to your floors. NON-SKID, NON-SLIP BACKING - Made of silicone and PVC Eco-Friendly materials, the bottom of the mat is designed to remain stationary without sliding around your floors. Dimples within the mat increase friction between mat and floors creating a suction like feel keeping your mat in one place. ELEGANT DESIGN AND COLOR - MATCHES ANY HOME DECOR - This mat has an elegant design, look and feel to it that will match almost any home decor. Two color options to chose from. INCLUDES FREE EBOOK on healthy eating habits for your cat or dog.